Garmin continues to be a major player in the smartwatch category with its latest release of its Fenix 3 HR smartwatch. The HR stands for heart rate monitoring, which picks up through embedded sensors on the underbelly of the watch face. That’s just one of the added features on the Garmin smartwatch that make it ideal for adventurers. Combined with Garmin’s trusted global positioning technology and “track back” technology, you’ll avoid get lost on the trail or need to carry heavier equipment. It even has the ability to tap into the Russian-based GPS system for complete global coverage. In addition to backcountry hiking, the Fenix 3 has multiple modes for different activities including cycling, running, golfing and more. So without having your phone nearby you can see where you’ve been, where you’re going and any goals you might set. It’s also waterproof to about 200 feet, so it’s good for swimmer and paddlers, and there’s a barometric altimeter built right into it. Using Garmin’s Connect Mobile App, the watch tethers to your phone for weather notifications, email and text message alerts and more. Not only is the Fenix 3 loaded with features, but it takes care for aesthetics as well offering a classic round shape with various options for face images. We caught up with Garmin’s Brian Green at Outdoor Retailer 2016 in Salt Lake City to see all the cool features this watch has to offer. “Whether you’re in a business suit or a swimsuit, it’s the perfect time piece,” Green said. 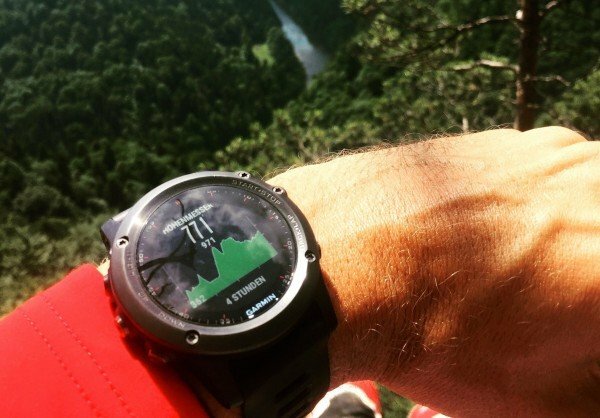 For more on the Garmin Fenix 3 HR smartwatch click here.